A common question I see posted on forum threads about moving to Hawaii is: “How much do groceries cost?” This question seems to spring from the common knowledge that Hawaii has higher grocery prices, because most goods are manufactured or grown outside of the islands and need to shipped over. It’s a good question to ask if you’re considering a move to Hawaii, because you’ll need to know how much of your household budget will need to be allocated to buying food and other groceries once you’re living on the islands. Different people buy different types and amounts of groceries — the monthly grocery bill for a married couple with two growing teenagers will be vastly different from a single woman who eats a vegetarian diet. So rather than try to give you a one-size-fits-all monthly estimate of the cost of groceries here in Hawaii, I’ve gathered links to the weekly ads of several local grocery store chains so you can “go shopping” and see the prices of items you buy on a regular basis. Which store has the lowest prices? 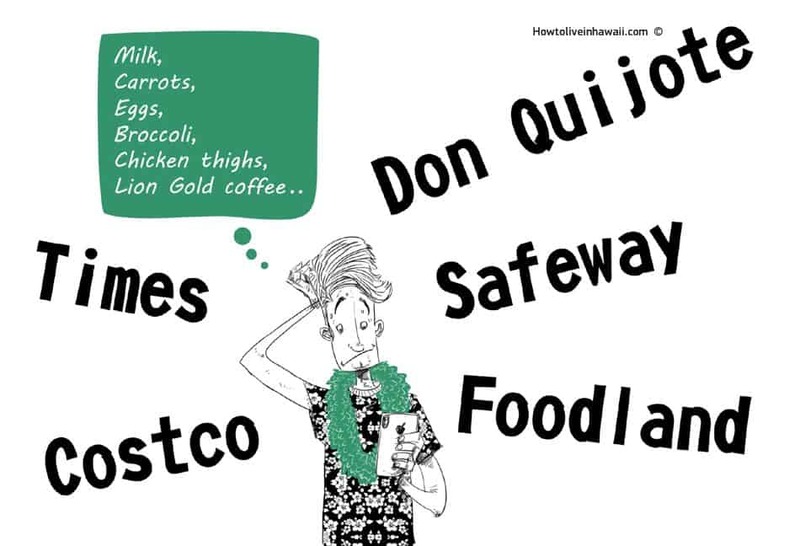 Last year, Hawaii Business magazine compared the prices of certain groceries at Don Quijote, Foodland, Safeway, and Times. When they added up the prices of those groceries at each store, Don Quijote had the lowest grand total. Some Hawaii residents might argue that warehouse stores like Costco, Sam’s Club, and Walmart have lower prices overall, but Hawaii Business magazine chose not to include those stores because they’re not as comprehensive in their grocery offerings as supermarkets are. I was curious, though, how Costco would stack up in their price comparison. I was never a huge fan of Costco until I moved here. With grocery prices being so high in general in Hawaii, the savings at warehouse stores like Costco are just too significant to pass up. In fact, everyone I know in Hawaii shops at Costco, Sam’s Club, and/or Walmart on a regular basis. To show you what I mean, I went to my local Costco and added up the prices of the same grocery items listed in Hawaii Business magazine’s price comparison (see table below). It’s not a perfect apples-to-apples comparison — Costco carries only a limited number of brands, so I had to make some substitutions, which I’ve noted below. There was only one item I was unable to find at all — the baby food — so to be fair, I used the highest price for that item that was listed in the magazine’s original comparison, which was Don Quijote’s. It should also be noted that the Costco prices listed below were taken from the Hawaii Kai location in Honolulu — I’m sure prices vary somewhat between the different Costco locations throughout Hawaii. As I expected, Costco’s total grocery bill is the lowest of the four stores. But it’s interesting to see that Costco does not have the lowest prices when it comes to milk and most meats — you’re better off buying those items at a supermarket. And if you’re a small household and can’t buy everything in bulk — for instance, buying a carton of 18 eggs at Costco makes no sense for me, because I can’t eat them all before the expiration date) — you’ll still want to shop at a supermarket for those items that you need to buy in smaller quantities. Supermarkets definitely still have their uses in Hawaii, even if they don’t necessarily have the lowest prices. Great comparison chart, thanks! We do most of our shopping at Costco and then get fresh produce at a Farmers’ Market every week. Every few weeks we head to a regular grocery store for items Costco doesn’t carry. For large bulk items I sometimes split them with a friend. Good idea on splitting bulk items from Costco with a friend! There are several items I hesitate on buying from there, only because I don’t want the food to go bad before I can use it. That’s a great solution. Hey, thanks Ryan! I really appreciate that! How did you forget Marukai?! You are right! Marukai definitely deserves to be on this list. Adding it now!